This page describes BSS Coloring concept used in WLAN 802.11ax standard. It mentions benefits or advantages of BSS coloring which solves issues or problems faced by legacy 802.11 networks(802.11a/b/g/n/ac). In order to maximize quality of experience (QoE) and to address issues such as CCI and OBSS (Overlapping Basic Service Set) interferences seen in legacy 802.11 networks, IEEE 802.11ax introduced following concepts. • OBSS is the overlap or interference between a BSS to which the STA is associated with and neighboring BSS to which STA in not associated with. Here STA refers to STATION or client wifi devices. • BSS color method as described below to differentiate between BSSs on the same RF channel. • OBSS packet detection (PD) is the ability to detect signals from other BSSs. • CCA (Clear Channel Assessment) threshold control is the ability of wifi device to change its CCA sensitivity based on its associated access point (AP) and current transmission. AP (Access Point) and its associated clients are called as BSS (Basic Service Set). The figure-1 depicts low frequency reuse case for 20 MHz channels. There is no co-channel interference in this case. 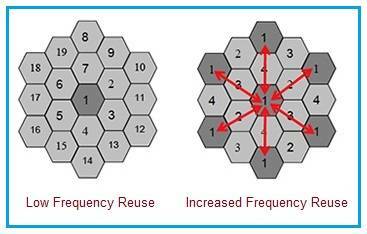 The figure-1 also depicts high frequency reuse case for 80 MHz channels. Here all same frequency channels used by BSSs in the wifi network are blocked. In such dense wifi network, neighboring AP can cause co-channel interference. Stations on overlapping areas will backoff excessively. This situation or problem is called OBSS (Overlapping Basic Service Set) interference or CCI (co-channel interference). What is BSS Coloring ? Above problem of legacy 802.11 networks has been alleviated by BSS coloring concept introduced in IEEE 802.11ax version. Using this feature, stations identify transmissions from another network and take right action accordingly. 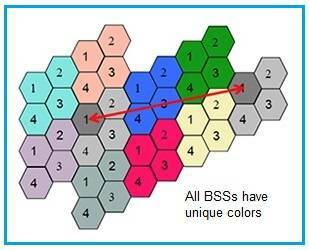 The figure-2 depicts BSS coloring concept. Here same channel BSSs are only blocked on color match. In BSS coloring concept, each BSS (i.e. AP) uses a different unique color which is 6 bits in size and carried by signal preamble or SIG field. Each STA (i.e. client) learns its own BSS upon association and other BSSs or OBSSs. ➨It is a technique used to improve co-existence of overlapping BSSs (OBSS) and to allow spatial reuse within one channel. ➨Signals with same BSS color use low RSSI threshold for deferral. This reduces collisions on the same BSS. This means BSS coloring helps in mitigating problem of CCI (co-channel interference) found in legacy wifi networks. ➨Signals with different BSS color use higher RSSI threshold for deferral. This allows use of more simultaneous transmissions.